Lots of neat stuff this week. We’ve got Rise of the Planet of the Apes concept art and a trailer, along with the trailers for Cowboys and Aliens (now with more aliens), Doctor Who and Priest. Scroll down or follow the link below for more. Did ya’ll catch the Facebook webcast about Rise of the Planet of the Apes? If not, you should. Go check it out here. Great interviews with Andy Serkis and others from WETA Digital (the folks behind the SFX in the Lord of the Rings trilogy among others) and a little bit of a peek behind the scenes. Make sure to also check out the concept art gallery which is always one of my favorite parts of these types of movies. You can go view the trailer at Apple.com/trailers or download the 720p version. 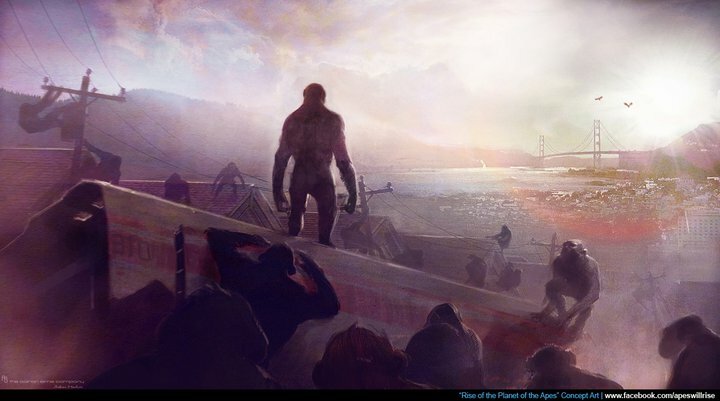 The trailer shows that we were the ones who started the rise of the apes. Just like in most other “oops, we caused our own demise” plots we were trying to create a cure for something and it went horribly and unexpectedly wrong. What I’m curious to see the explanation of is how the apes bred so quickly. In one scene it is just one ape (Ceasar?) who becomes intelligent, then there are a few dozen escaping the lab (how many could there be? ), then all of a sudden they are rampaging down the streets. It seems to me that at least early on, we should have the edge in firepower and sheer numbers. Everything I’ve heard so far about this film, mainly from AICN, is that this film is primarily a western rather than a sci-fi flick. The analogy is that the aliens take the place of indians in old-school westerns when they come into town and kidnap folk. Then it’s up to the heroes to track and find their loved ones. I’ve always been a big fan of Harrison Ford, and Daniel Craig is getting up there are as well. I wasn’t really a big fan of Olivia Wilde on House, but I really liked her role in TRON: Legacy as a lighter, funner, smilier character so I’m curious to see which way she goes in this film. Via AICN, two trailers for the upcoming season of Doctor Who. I really like the combo of this Doctor and Amy. They are right up there with the David Tenant Doctor and Rose. The second trailer hints at some really dark stuff happening. One of the great things I like about this show is they aren’t afraid to explore both ends of the spectrum of hope.